I am asked to review things fairly regularly these days. One of the perks of Permanent Style’s popularity, you might say. Unfortunately, most of the things are awful: $20 ties, ‘fashion’ T-shirts, even garden furniture. When will PRs learn that mass emails don’t work with bloggers? One such random e-mail two weeks ago struck a chord, however. Someone at Philips asked me to review their latest ‘personal grooming’ device, the Multigroom QG3270 (catchy name, no?). They had read in a previous post about shaving that I normally cut my own hair and trim my own beard (there is little enough of both to make it fairly straightforward) and asked if I was interested to compare their product with my existing clippers. Those clippers are about 12 years’ old, so I said yes. In case anyone is in doubt, the product was given to me free. The major advantage the Multigroom has over my old Braun clippers is that it is wireless. It charges on a base, saving me standing that little bit too far away from the mirror and too close to the plug. The major negative is that it is a rather lightweight product, and I can’t feel it is unlikely to last 12 years with no need for maintenance, like my Brauns. In both instances, my impression is that these are features of the modern product. The Philips is also not at the top end of the range, retailing at £30. The Philips model comes with a far larger range of attachments, including some enabling to precision trim the edge of my beard (not really necessary) and to trim my ear or nose hair (ear thankfully not necessary, nose actually quite useful – a lot easier than scissors). There is also one attachment for a beard and a separate, larger one for the hair. There is little to say about quality. Both old and new cut hair. No clumps were randomly missed. I have my opinions about longevity, as mentioned, but those are nothing more than speculation really. Nice to have a new set though. 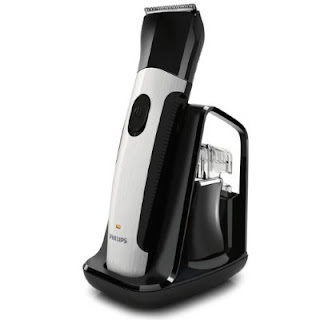 You can follow the discussion on Review: Philips Multigroom by entering your email address in the box below. You will then receive an email every time a new comment is added. These will also contain a link to a page where you can stop the alerts, and remove all of your related data from the site. This was a good informations for people who need this, and i am sure that this little help would be as great for us. thank you. Do you use beard oil? I’ve been thinking about buying some from Antica Barbiera Colla now that I’m finally jumping on the beard bandwagon. I wish you would do more posts on grooming products as there’s much more noise in the market vs bespoke tailoring. Cheers.